On our page, you will find our Context for Learning for each half term alongside plenty of photographs of our amazing work. We hope you enjoy surfing our page as much as we enjoy learning! Keep your eyes peeled for new learning each week. As a special treat, Rosie's grandad came into Year 5 to discuss his childhood during the WW2. The children discovered that every person (even children!) had an identification card to prove they weren't a German spy, every household had an Anderson Shelter and the skies were left red from all the bombings. A very interesting interview! 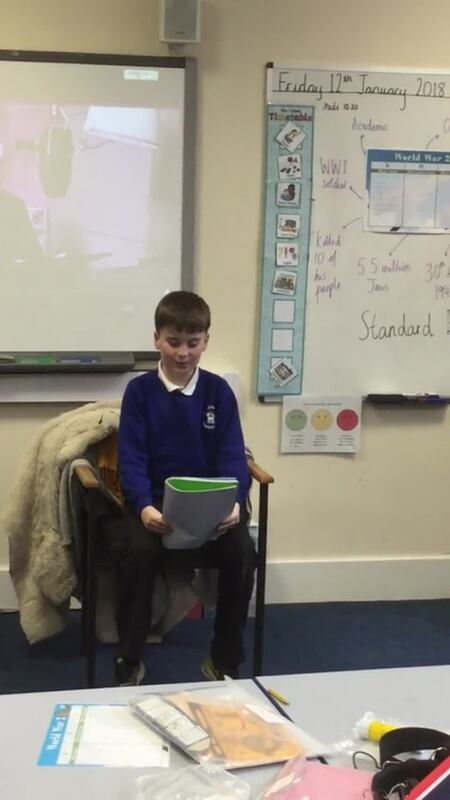 Year 5 have been introduced to World War II this week and have been in role of Neville Chamberlain announcing the war to the whole of Britain! The children really enjoyed using their drama to show off their understanding of world leaders. Well done everyone! Our Context for Learning (Spring 1). Feel free to download this! Our Context for Learning (Autumn 2). Our Context for Learning (Autumn 1). We have been learning how to make computer games by using our programming and algorithm skills. We have been learning all about the USA and the history of the Native American's. To get a real sense of being a Native American, we took it upon ourselves to build and decorate a Native American tepee with extravagant colourful Navajo patterns- take a look! © 2019 St John's CofE.